After living in Barcelona for almost two years I have to say, I’m still madly in love with this place. I adore the steady pace of life and the serene Mediterranean sky is irreplaceable. I take great pride in the land of Catalonia, especially its cuisine. To begin, since it’s the first entry after all, we’ll start with the basics. And there’s nothing more quintessential and wholesome than pa amb tomáquet, bread with tomato. The pure satisfaction of its simplicity underscores how less is always more and with quality ingredients there’s no room for fuss. 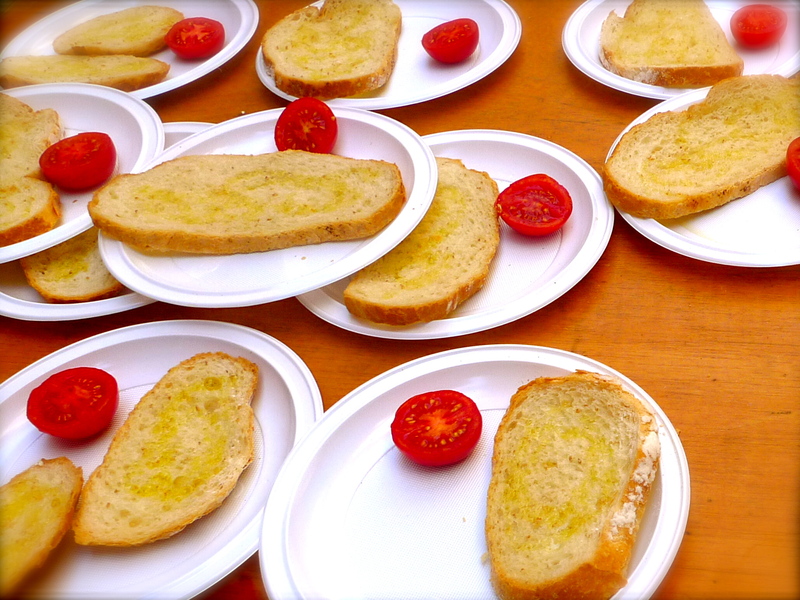 The mixture of garlic, tomato, salt and olive oil leaves an unforgettable taste. The brilliant combination of these common ingredients epitomizes what Barcelona stands for- effortless pleasure and surprise. Catalonia produces a special variety of tomatoes specifically for the purpose of smearing bread called tomáquets de penjar, hanging tomatoes. The seeds are planted in early spring then harvested in fall. A string is passed through the stem of each tomato by hand then the collective bunch is hung from ceilings. The tomatoes can last for 4-6 months when stored properly in a cool dark place. These golf ball sized gems are exclusively used for bread with tomato for one unique reason- they produce an astonishing amount of juice! Pa amb tomáquet is generally served as an appetizer along with cured meats and cheese. Unless you’re reading from the Catalonia region chances are you don’t have access to hanging tomatoes. No fear, a plump tomato can do the trick as well. You can use a cheese grater to extract the juice and pulp. Serve with an assortment of cheese, cured meat and mucho amor! *Click on hanging tomatoes photo to connect to a Catalan blog for more on this dish. This entry was posted in Barcelona, Taste and tagged Catalonia, jeno, recipes, taste. I fell in love with preparing my bread this way after coming back from Barcelona. I even have a T-shirt that shows how you prepare it this way. This has been a hit with some friends at a recent dinner party. Sounds delicious! Looking forward to future posts. You gotta try it grilled, Colin! I think it adds a more masculine taste to it. A soft goat cheese spreads nicely with it too. definitely going to try this. I feel like I’ve forgotten the simple pleasure of artisan bread dipped in olive oil with a few chilli flakes. Thank you for this! I have tried this, made by the author’s hands! It is sublime. Aw shucks, Nancy, thanks :) besos!!! I’ve enjoyed reading your post Jeno!!! You are perfectly immerse in the Catalan customs… and as a Catalan I feel proud for this… I must say that one of the things I missed the most when we were in the US was our… pa amb tomàquet!!! I am very pleased to know you and your blog !!! I am also very proud of your task…and let the noth-american people know our traditional and wonderful dishes (as you can imagine this is one of the most simple). Please, taste “pa amb tomàquet” as soon as possible !! !…you are wasting your time and life eating so much burguers !! !…believe me, juas,juas !!! Very good work, Jeno !!! Congratulations !!! Even all the way in Bali, I had this prepared by my Barcelonian co-worker the other day. Seems like the Catalans can’t let go of this simple yet delicious dish! You are making me hungry. Will definitely try this one! YUM. i made this last night for a cheese + meat party… delicious, and i love that you can find these ingredients anywhere. Awesome! I made it as a grilled cheese this morning. You can find the ingredients anywhere and it’s versatile! Buen trabajo Jeno!!! Felicidades!! no puedo esperar a tu siguiente post!